Krav Maga is the Israeli based system of self-defense and close combat. The focus of Krav Maga is to train a person's reflexes to effectively and naturally respond in dangerous situations. Within Krav Maga, you do not adhere to one process. Rather, the basics you learn are simply combined with additional dynamic movements. It is this freedom to improvise that allows fast adaptation to any given situation. Class appropriate for ages 14 and up. For ages 9-13, please check out our youth program. A student will have learned basic movement, striking, and an empowering self-defense technique. Krav Maga has an incredibly short learning curve as we keep things simple. Within four weeks, students will be able to throw a proper punch, groin kick, and demonstrate a self-defense technique. There are six levels within Krav Maga. Each level has a system of techniques that prepare the individual for certain strikes and training fundamentals. Within the first three months, students will grasp the following Level 1 self-defense techniques: movement, basic punches and kicks, and strike with force. Welcome to the next level. Every six months, all students complete a level testing where techniques must be executed under physical stress for real world application. Training against knife, gun and other weapons. Groin guards are required for men. Mouth guards and gloves recommended for all. Learning any form of self defense requires patience, discipline, and awareness. The first priority is to understand your limitations mentally and physically. Precision Defense Training emphasizes a respectful environment in which each student feels comfortable. No politics, no competition; our training facility is a neutral zone. Your only competition is yourself. We will push you past your limits to make you stronger, faster and better! Safety is always our top priority and Precision Defense Training provides a full gear pack for class. For your safety and comfort, men are required to wear a groin guard for all classes. This is a non-negotiable rule: no cup, no participation. A mouth guard and gloves are also recommended when practicing certain techniques. 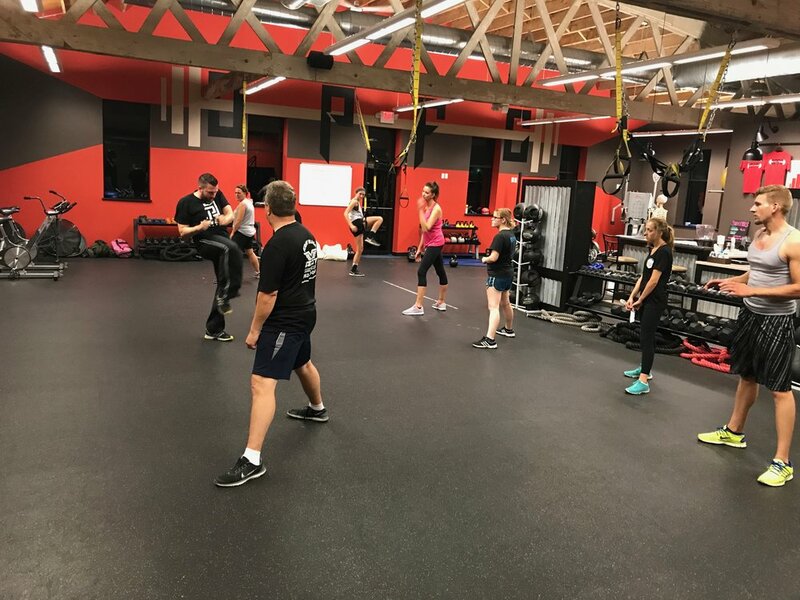 During Krav Maga courses, you will be partnered with individuals to practice strikes and self defense techniques. This involves holding a pad and interacting using a fake weapon to simulate an encounter. If a student does not feel comfortable with a certain partner or interaction, please notify Chris. He will personally assist you until you feel at ease. Naturally, respect for your partner is key to prevent injuries and learn the proper techniques. Students are expected to attentively watch, listen, and ask questions. Students first observe Krav Maga self-defense techniques at full speed then watch each part broken down before practicing it with partners.